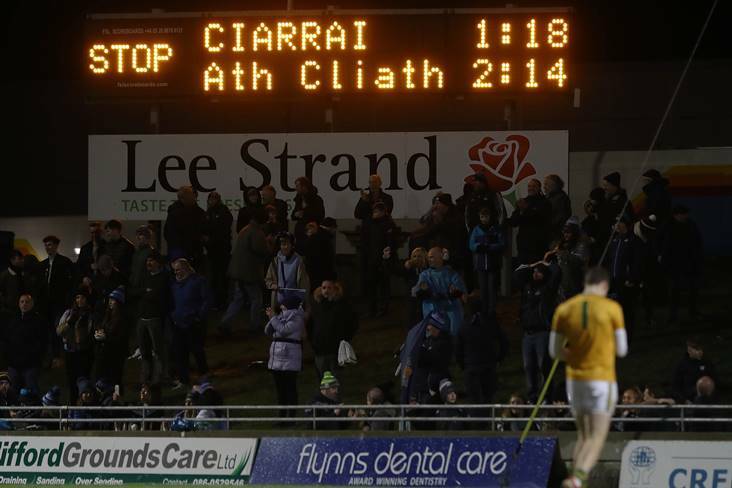 The full-time score of the Allianz FL Division 1 round 3 clash between Kerry and Dublin at Austin Stack Park, Tralee. ©INPHO/Lorraine O'Sullivan. It would seem rumours of Gaelic football's demise have been greatly exaggerated. All of the sport's ills were forgotten about for 70 glorious minutes last night as old rivals Kerry and Dublin served up a brilliant contest in front of the RTE cameras at a sold-out Austin Stack Park in Tralee. If only ever game could be like that! We know Dublin don’t have much done, and we know Kerry do, and that it’s ‘only’ the league and some key names were missing, but that was wonderful fun in Tralee last night. Two teams taking each other on, utilising all the trappings of modern football. More please! What a game! Start to finish it was brilliant. Kerry very impressive again but Dublin to their credit almost stole a point. Onwards & upwards for Kerry. Full Time in Tralee and our Boys In Blue have lost out by a point to Kerry. A great game of football, congratulations to Kerry and hard luck to our lads who battled to the end. Brilliant game of football in Tralee. Kerry young guys giving a huge account of themselves. Great entertainment.